Due to Library's Seismic Retrofit Project, many offices on the north and south ends of the building and in the basement have moved elsewhere in the building or out to the Campus Events Field this summer in anticipation of the work beginning this fall. The Tech Help Desk has moved from the 1st floor to Library 208 on the 2nd floor. The computers from L122 have moved to the 2nd floor, near the center of the building. Read more about this year-long project in our special edition Seismic Newsletter or on the webpage Library Seismic Retrofit Project and feel free to contact the Library Dean, Cyril Oberlander for more information. Come find out the latest information about your Library and library partners while meeting wonderful people and enjoying yummy refreshments. Pick up a passport and visit all the tables to win prizes! InterLibrary Loan - if your library doesn't have it, ILL can get it for you! Digital Media Lab - learn to create video, audio, photo, and web-based projects with special software and equipment like GoPros, 360-degree cameras, microphones, and more! HSU Press - with voter registration! Please enjoy this short video illustrating the many benefits of participating in HSU's annual ideaFest held in April. Also, check out HSU's Flickr site for more photos of past events! Seismic Edition of the Library Newsletter Now Available! The Seismic Edition of the Library's Newsletter is out with a description and maps of the relocations happening for 2018/19. There are also several links to more information about the Seismic Retrofit Project. 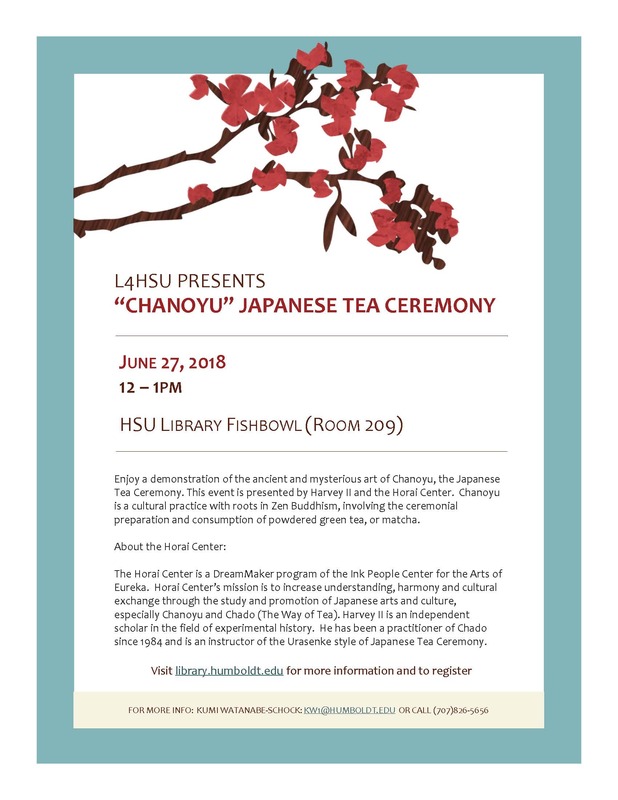 In addition, get a taste of the exciting programming being offered through L4HSU this summer, and read a few comments from students who say "We love the library because..."
Faculty - Have you joined the Sustainable Learning Program yet? Over the past 2 years, the switch to open education resources and more affordable classroom materials has saved HSU students over $1 million and counting! Learn how you can be a part of the exciting and valuable program by attending a 3-hour workshop (lunch included) on Tuesday, May 15th or Thursday, May 17th from 12-3pm. Participants will also receive a $300 stipend thanks to a CSU Affordable Learning Solutions grant. Register at https://tinyurl.com/sustainablelearning and see the HSU Sustainable Learning webpage for more information. This summer's L4HSU (Library Lifelong Learning Lounge) starts with a Lock-in Launch on Thursday, June 7th at 9:45am. Join us for part or all day of this fun and interesting event focusing on communication. There will be videos, discussions, activities, tweeners, music, and lunch in the Library Fishbowl. Starting the following week, staff, faculty, students, administrators, and community members are invited to join the Library Lifelong Learning Lounge (L4HSU). This summer's theme is Communication with a focus on both Personal and Professional Communication. In addition, each week we will have a variety of Wisdom Wednesday offerings for other topics for personal growth such as ukelele jams, escape rooms, rock painting, role playing games, Japanese tea ceremony, and much, much more. Check out the calendar for several discussions on microagressions, racial identity, and adversity. Michael Le shares his love for data with the Data Democracy series on Fridays and Jessica Citti saves grandma with commas. Get the lastest on the campus dog policy with Kevin O'Brien before he retires and help build community with the 2-part Day of Solidarity. With so much being offered, you are bound to find something of interest. L4HSU supports the personal and professional development needs of all HSU community members and runs June 11 - July 27, 2018. Contact Sarah Fay Philips with any questions. Can Emu Really Sing Jambo? New Book from HSU Press! Thursday, May 3, 7-8:30pm - A dramatization of the book by elementary school students, accompanied by songs especially written for the occasion, followed by a book signing at South Bay Elementary School, 6077 Loma Avenue, Eureka. Friday, May 11, 5:30-7pm - A reading and signing accompanied by live music and free snacks, at Wrangletown Cider Company, 1350 9th Street, Arcata. Wednesday, May 23, 6:30-8pm - A playful reading and book signing accompanied by live music at the Humboldt County Library's "Family Fun Night Stuffed Animal Sleepover, 1313 3rd Street, Eureka. 50% of sale proceeds go to the art, music, and library programs at South Bay and Pine Hill Schools. Read more on Humboldt State Now: HSU Press Presents Bilingual Children's Book. Please join us as a team of students in HSU's Media Production Department showcases their video series entitled "1-IN-10," which aims to raise awareness across campus about students with disabilities and accessibility issues here at HSU. This includes interviews with students, faculty, and staff. "One in Ten students at HSU lives day to day with a disability." Learn more about how you can support the 1 in 10 on Friday, May 4th from Noon to 1pm in the Library Fishbowl. Funding provided by the California Lottery Project.